Angra São Jorge), granted as separate donatarias. which become known as the "Fleming Isles"
but the islands resist Spanish rule until 1583. 2 Aug 1766 Islands united (Captaincy-general of the Azores). 26 Jan 1771 Unification of the islands formalized. opposition to King Miguel (s.a.) in Lisbon. 4 Jun 1832 Overseas province of Portugal (Azores Province). 18 Jul 1835 Status changed to districts. Ponta Delgada [Santa Maria and São Miguel]). Pico, Flores, Corvo islands) established. split from Angra do Heroísmo district. base and U.S. base, both at Lajes on Terceira). 27 Aug 1975 Regional Junta governs all islands. 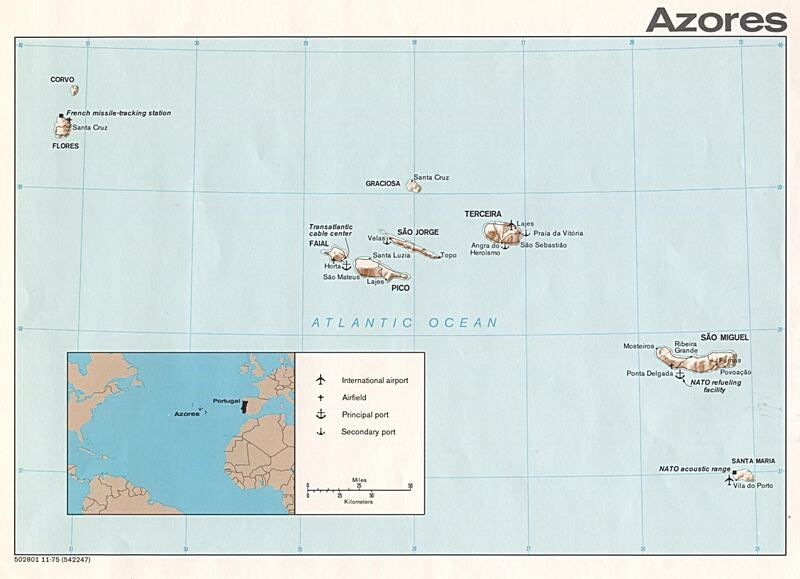 27 Aug 1976 Azores Autonomous Region within Portugal. c.1461 Santa Maria e São Miguel a donataria. 10 Mar 1474 Santa Maria a donataria. 2 Aug 1766 Part of the Captaincy-general of the Azores. 4 Jun 1832 Incorporated into the Crown possessions. 10 Mar 1474 São Miguel a donataria. 13 Feb 1820 Incorporated into the Crown possessions. 1450 Ilha de Jesus Cristo donataria. 17 Feb 1474 Divided into Praia and Angra (São Jorge) donatarias. 1641 - 1642 Angra and Angra confiscated by the crown. 1655 - 1663 Angra confiscated by the crown. 1712 - 1715 Angra confiscated by the crown. 1749 Praia incorporated into the Crown possessions. 1470 Praia da Graciosa a donataria. 1475 - 1485 Santa Cruz da Graciosa a donataria in northern part of island. 18 Feb 1737 Incorporated into the Crown possessions. 21 Feb 1468 Faial a donataria. 29 Dec 1482 Faial and Pico a donataria. 1642 - 1680 Confiscated by the crown. 1 Mar 1504 Flores e Corvo donataria re-established. 1570 - 1593 Administered by the Ordem de Cristo (Order of Christ). 1759 - 1814 Confiscated by the crown. 1832 Incorporated into the Crown possessions.